This post follows on from the previous (see part 1 and part 2). Here I’ll close out this series of posts by performing a bit more abstraction and finish up with some thoughts about how and to what extent the Cucumber abstraction fits in. Continuing on directly from the last post, we have a fully working implementation of a Cucumber feature file. This feature file is matched up to a series of step definitions which in turn delegate to a page object. In this post, I want to abstract away from the page object. But how? What I want to do is focus on a user who is acting out a series of steps. Here I’m using the @Steps annotation. The @Steps annotation marks a Serenity step library. In Serenity, the idea of a Step Library is to add a layer of abstraction between the intent and the implementation. I talked a little about this in my somewhat generic post on Java Automation with Serenity. This idea, however, takes on an interesting focus when you throw Cucumber into the mix. After all, the idea of Cucumber feature files — and their associated step definitions — already suggest such a separate of intent (“what”) from implementation (“how”). So are just adding a superfluous layer here? In my view, not necessarily. The step library concept of Serenity can help you organize your overall code into more reusable components. This is the case regardless of whether Cucumber is in place or not. With this current example, what I’m suggesting here is a move away from page objects and instead saying that Cucumber steps should be done in the context of a user’s actions. So, for that, I’ve established that there will be an instance of a User class. Where should this class go? ScenarioSteps refers to a set of reusable steps for use in an acceptance test suite. The idea is that any class that extends the ScenarioSteps class calls the step library. So keep in mind what we have here. 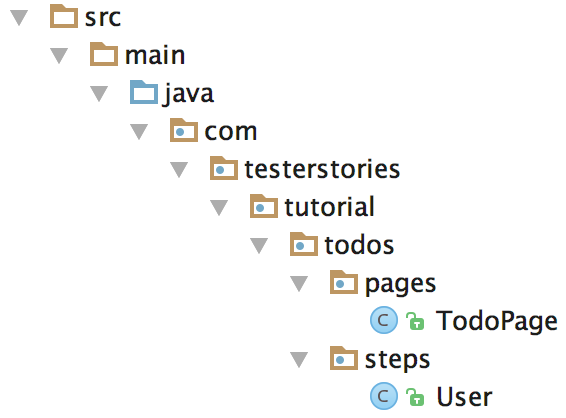 We have a test steps file (RecordTodoSteps) that has a particular instance (user) annotated with @Steps. That tells Serenity that this class is going to contain a series of steps that should be reported on as part of test execution. In effect, the User class is going to be the step library. Keep in mind what we’ve done here. This is important. Notice that here I’m referencing the page object (todoPage) in this class and I have a @Step annotated method that indicates that when this method is executed, it should be reported on in the test reporting. Keep in mind that the user class is a step library. That means it is composed of methods that are steps. You indicate which methods are steps by the @Step annotation. Notice that each method has a @Step annotation. Yeah, that’s great and all … but haven’t I really just shuffled code around? In one sense, yes. But in another, very real sense, no. What I’ve done is moved the potentially more volatile code further down the stack. So my Cucumber feature file provides a certain level of intent, my test steps provide a certain level of implementation. That implementation is rooted in the actions of a user. That user delegates to a page object in this case, because that’s what is being tested. But that same user could be delegating down to a mobile emulator or to a REST service. So what I really want is my Cucumber features to be a bit more declarative. How about this? Users need to be able to quickly add tasks as fast as they can think of them. Notice here that I didn’t have to change my User class at all nor did I have to change the page object, TodoPage. While this is admittedly a very simple example, I do think it showcases exactly how you want to think about “pulling down English” versus “pushing up English”. Notice, however, that to do this I had to use the “*” operator in Gherkin, which effectively just means “any step.” Not all BDD tools support this. JBehave, for example, does not. This is where I think Gherkin can becoming constricting. Yes, it’s “busier” than pure English would be but, on the other hand, as we’ve just seen I can keep my English fairly constrained by sticking just to the business rules. Instead of trying to “modularize” at the level of natural language, I modularize at the code level, where that kind of practice belongs. 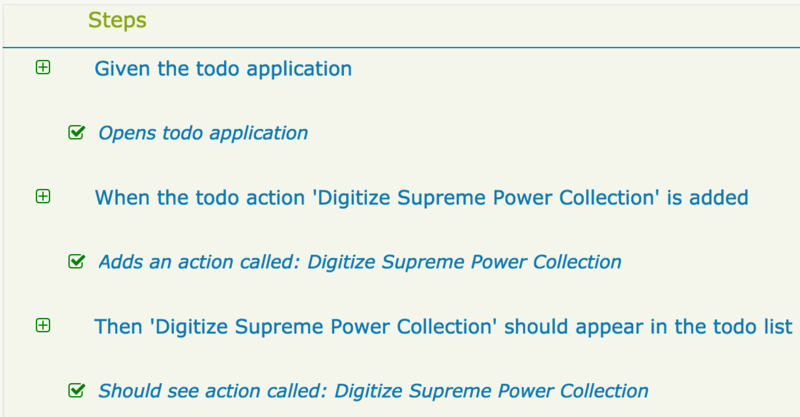 Further, it allows me to push English back up, so that if people do want the implementation details, the automation can serve not just as an execution mechanism but also as a documentation generator. To drive this home a bit, here’s an example of how most business teams I work with want to describe features and scenarios. Doctors provide information about medical conditions to patients via targeted articles. Patients need to be able to access those articles conveniently. This, to me, is perfect. It’s exactly what I want from product and business teams. A statement of why this overall feature adds value. Then a breakdown of how it adds value by talking about a high-level interpretation of what the feature does to provide value. It’s now up to developers and testers to work out the logistics of what exactly the solution will look like. The development code and test code should be developed in tandem. This way both sets of code become a common specification and thus a single source of truth. This is somewhat in line with some of my thinking from modern testing. Notice, too, that the concept of specific users can be directly translated from those business requirements into a particular type of class (DoctorUser, PatientUser). Even better, if you go with the Screenplay approach that I talked about in previous posts, you can treat Doctor and Patient as particular types of Actor instances. This gives you a lot more flexibility to change based on development spikes or the product team refining its understanding. How you manage that flexibility is the effective use of abstraction layers. You’ll notice that, in this post, that meant going towards a very minimal implementation of a “Gherkin” style specification. I’ll close off here with this final consideration. Ask yourself this: why are “Gherkin-like” approaches chosen? Usually because those are “easier” to automate. But it’s not necessarily because it’s easier to speak in. People don’t “speak Gherkin.” The above example of Patient/Doctor was plenty good enough to spark further conversations and collaborations. And you’ll notice not one bit of that is in Gherkin. So while the posts in this series have focused on the integration of Cucumber and Serenity, I want to leave you with the thought that you should, at minimum, consider the level of expression in terms of how you use Cucumber. Beyond that I would hope you consider whether or not Cucumber, and the focus on Gherkin-style feature files, is even the most effective or efficient approach. This entry was posted in Automation, Cucumber-JVM, Serenity. Bookmark the permalink. I have read all your posts about Serenity (about Screenplay pattern and Cucumber integration) and I think that these are the best texts about it. You are writing step by step what is going there and it is very simple to understand. You helped me understand Screenplay pattern so I am changing my POM framework to it at the moment. Thanks for good job! Great post! But I have some questions about having multiple pages to interact with inside User @Steps. In your example you have only to interact with TodoPage, but let’s say you have two pages where in each of them you have to fill a form, eg. : Login, ResetPassword. In this example I will have to enter e-mail address on both pages. Would your code look like this? But I don’t know if there is a better way of doing it. What do you think? Hey there. Unfortunately, I don’t really use Serenity anymore. I just found it got a bit too heavy and cumbersome. That’s just my opinion and certainly not an indictment of the tool in some wider sense. But the reason I give you that context is because I’m probably not the best one to answer your questions. There is a Google Group and, I believe, a Slack channel that will probably serve you much better than I could at this point. Another guy searching for better documentation for Serenity and Cucumber JVM test automation. I happened to read your series on the topic and thoroughly reading them again and again. BTW, in your reply to Majda’s question you wrote “There is a Google Group and, I believe, a Slack channel that will probably serve you much better”. Would you mind posting the URLs for those two resources please ? The Google groups that I’ve searched out are the Serenity BDD Developers Group (https://groups.google.com/forum/#!forum/thucydides-dev) and the Serenity BDD Users Group (https://groups.google.com/forum/#!forum/thucydides-users). Their Slack channel has apparently been moved to the Serenity BDD Rocket.Chat (https://serenity-bdd.rocket.chat).